One of the Korean War's Most Closely Guarded Military Secrets! The young Army Corporal waited nervously for the guards to arrive. He looked one more time at the barren walls and desolation around him, the meager facilities in which he had struggled for survival for the last 28 months....a North Korean prisoner of war camp. For a change the approach of the guards would be a welcomed sight, Hiroshi Miyamura was finally going home. Life in the POW camp had been hard. It wasn't only that food and shelter had been so primitive, it was the added pain of torture and constant brain washing. "Hershey", as young Miyamura was called, had watched many of his fellow soldiers die slow, painful deaths at the hands or the neglect of their captors. His own body was suffering from dysentery and he had lost 50 pounds, a horrible loss to a man already small in stature. As a Japanese- American soldier, the North Koreans had held a special hate for the young man from Gallup, New Mexico. Now, at last, Hershey felt he had survived their hatred and torture and would finally see his young wife and family once again. It wasn't Hershey's first war, he had been called to duty back in 1944 at a time when many Japanese-Americans were prisoners in their own Nation--deprived of their homes and possessions--interred in "relocation camps". Determined to prove their loyalty to the United States, some of these young soldiers had established an incredible reputation as brave soldiers in Europe. By the time the war ended the Nisei 442nd Infantry Regiment had tallied an incredible 47 Distinguished Service Crosses, 354 Silver Stars, and over 3,600 Purple Hearts. 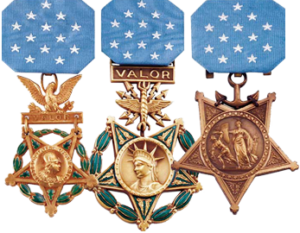 Sadao Munemori had exemplified the patriotism and courage of the young Nisei, sacrificing his life for his native United States and earning the Medal of Honor. Nisei were Americans born to immigrant Japanese families. Hershey hadn't seen action in World War II, however. Five days before his troop transport was to land in Italy the war ended. Hershey was proud to come home with the valiant 442nd, returned to his native Gallup and a waiting job as an auto mechanic, and a stint in the Army reserves. He married his sweetheart in June 1948, just before his enlistment in the reserves was to end. And then, fully aware that a re-enlistment would probably call him to active duty, Hershey made the choice to continue serving his country. At 4:00 A.M. on Sunday, 25 June 1950 almost 100,000 North Korean soldiers crossed the 38th parallel into South Korea. Within days the fall of the democratic southern nation seemed imminent, reprieved only by the September 15th amphibious landing of MacArthur's troops at Inchon. China responded first with threats, then on November 26th with the sudden swarm of 200,000 "volunteer" Chinese Communist troops across the Yalu River. Watching from too close a distance was a machine-gun squad led by the young Nisei from Gallup. "I could see them swarming across the river through my binoculars," Hershey recounted. He and his squad withdrew with time running out and managed to catch the last ship departing Hungnam before the Communists swooped upon and destroyed the town. Hershey had been in the field almost continually for seven months as the joint United Nations Forces were driving to retake Seoul. During the darkness of night on April 22, 1951 the Chinese attacked in force along the Imjin River. By dawn the swarming enemy had overwhelmed the defending forces and the Americans began to withdraw across the river. Hershey's squad of less than a dozen machine gunners and five riflemen was ordered to take up defensive positions on a nearby hill. No one expected them to last long, just to delay the inevitable onslaught of the enemy forces. That onslaught came with bugles and whistles on the night of April 24th. For hours the enemy poured over the hill in waves. Manning his machine-gun in the face of the horrible assault Corporal Miyamura watched as the sheer force of numbers combined with deadly rifle fire and exploding grenades began to decimate his squad. As the remnants of his squad struggled for survival the young corporal noticed a mounting force to his flank. Without hesitation he jumped from his shelter to attack with his bayonet, incredibly overtaking 10 or more of the enemy and buying his embattled soldiers a few more precious moments. Then, returning to his soldiers, he began treating their wounds and directing their evacuation. Suddenly another wave swarmed the position. The brave young corporal returned to his 30-caliber machine-gun to rain effective fire on the encroaching horde until his ammunition was gone. His squad almost annihilated, he ordered the remaining men to withdraw to safety while he set about disabling the machine-gun before it could be captured by the enemy. Then, as they swarmed over his position, he literally bayoneted his way through them to reach a second gun emplacement. From this position he ordered the remaining Americans on the hill to withdraw while he covered them with effective fire. It was the last he ever saw of his men, or they of him. Wave after wave was thrown against the hill now held by a single machine gunner. When finally he could hold out no longer, Corporal Miyamura sought shelter in a covered bunker. The area in front of the machine-gun he had left behind was littered with the bodies of more than 50 enemy, tribute to one soldier's determination to hold them at bay while his men pulled back. But it was only the beginning of a long night for what may have been the only living American on the hill, surrounded by thousands of fanatical Chinese Communists. Wounded, he struggled to return to safety, engaging chance encounters with the enemy in desperate hand-to-hand combat. By dawn the exhausted corporal found himself playing dead in a ditch as literally hundreds of enemy walked past his prostrate form. One of them, a Chinese officer, was not fooled by the bloodied body laying so still along the road. Hershey was captured and sent to a prisoner of war camp where the worst of his ordeal began. For twenty-eight months he struggled to survive, to defeat the captors who did their best to break his spirit and his mind. For more than a year his family knew nothing of his situation, knew not whether he was dead or alive, for the Chinese had not released news of his status as a Prisoner of War. Throughout the long days and the lonely nights when he wasn't thinking of home, Hershey thought of his men. His squad had been ripped away from him the sheer force of overwhelming numbers. Unaware that, due his own courage, many had reached the safety of the American lines, the corporal believed they were either all wounded or dead. He wanted to be home but his thoughts of home were tainted by the prospects of his future. At times he was certain in his own mind that if he ever did return it would be to face a courts martial for losing so many of his men. And now that long awaited moment of truth had arrived. It was August 23, 1953 and Hershey had been escorted by his captors to make his way through the crowd of returning POW's at Freedom Village near Panmunjom. From the waiting officials surrounding them Hershey heard a strong voice inquire, "Are you Corporal Hiroshi H. Miyamura?" Looking up the soldier in prison uniform saw the crisp image of a United States Army General Officer. The moment of truth had arrived and, he thought, momentarily the MP's would arrive to take him into custody to await his long dreaded courts martial. But there was no avoiding the truth. Even among the tattered remains of the returning POW's the young Nisei stood out, so he finally nodded in affirmative. To his amazement the general extended his hand with the stunning announcement, "Congratulations. You've been awarded the Medal of Honor". For young Corporal Miyamura that statement was more than amazing...it was unbelievable. Just as the Chinese had held the secret of Miyamura's capture for more than a year, the United States Army had maintained a secret about the young soldier for the 28 months of his imprisonment. Later Corporal Miyamura was told the reason. Had the Chinese captors known of his award, "You might not be here, alive, today." 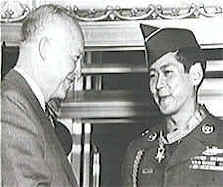 Two months later on October 27, 1953 Army Sergeant Hiroshi H. Miyamura visited the White House as a guest of honor. President Dwight D. Eisenhower shook his hand and placed our Nation's highest honor around the neck of the Japanese- American boy from Gallup, New Mexico.